Today, we live in a world that celebrates mistakes. 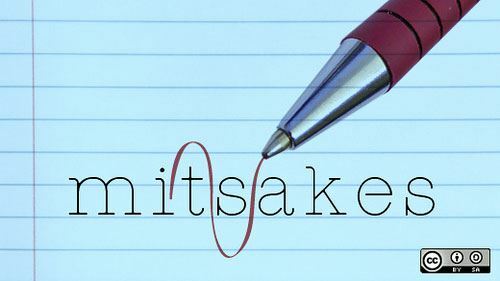 We see mistakes as the natural outcome of trial-and-error endeavors, valuable learning and growth experiences and necessary steps for success. To the entrepreneur, a trail of mistakes is the new badge of honor. By understanding the inherent value of the mistake process, we can clarify quickly what doesn’t work. It immediately frees us up to pursue our endeavor in other directions. Unfortunately, even before we can get into the mistake making process, there’s a tendency to fall for any of these 10 core business mistakes first. There’s nothing wrong in believing in the “great idea” or dream. However, being unrealistic about doing business will certainly put you on the path to making mistakes much more quickly. By not starting off with intensive market research, you have no idea if there’s a viable market that’s large enough to market to. By doing research first, it allows you to create and work from a realistic business plan. Having self-confidence is an important element in business success. Being overly self-confident, thinking you can do it better, only pays off when you have already taken the time to find out what they did and why they failed. If not, you’re doomed to covering the same mistake territory. It’s again your idea, your vision why shouldn’t it be perfect as you intended? If you want to mistakenly allocate time well spent elsewhere or micromanage every detail, don’t be surprised if a competitor scoops up your business before you hit the market. It’s all well and good that you have personal preferences, ideas and a vision that are driving your actions. Mistakes come into play when the vision is closed to other possibilities. A lack of flexibility to accommodate shifting market trends can also lead to mistaken perceptions of not being relevant or outdated. You love your business endeavor and whole-heartedly invest your time and energy. But, you mistakenly believe you’ll never get sick, suffer from burn-out or have progress interrupted by forces beyond your control. Without a backup plan or trusted support system, you and your business are on hold and going nowhere. This the mistaken belief you will be able to anticipate mistakes and keep them from happening, or certainly fix them quickly. Business today is a structure that functions on multiple levels of complexity and technology. Consequently, the chances of mistakes happening, yours of those of others, is greatly increased. Also, comes the realization that not everything can be fixed by a Google search. There’s also the mistake of not being proactive and preparing for “what if” situations. How are you going to continue to run your business if any of these common interruptions should occur? It could be a weather related loss of power, a hard-drive crash, hackers getting past security, downtime to change service providers, or going offline until the malware and Trojans get cleaned out. Having an alternative plan for continuing to be able to service customers can sometimes make or break a business relationship. Again not wanting to trample on your vision or dream, sometimes there’s the mistaken mindset that no one understands what you are really trying to accomplish. By not taking into consideration the well-meaning advice or observations of others, your chances of a profitable outcome are delayed. It’s also the same as not investing in a coach or mentor with the expertise you have yet to achieve. The mistake of being in a hurry probably creates more mistakes down the line than any other. It means that you’re more likely to take short-cuts and outsource to those with the cheapest prices. You don’t allocate enough time to think things through as to what you actually want vs. what you really need. And, you’re not likely to do the deep research to find out what customers really want – not what you think they want. While you think your business is not yet turning a profit and legal things can wait, that’s a mistake that can cost you big time. Some mistakenly believe they can just copy legal declarations from another’s website, use sample contracts or agreements, quote text without credit or permission or freely copy any image. There’s also a host of other legalities that can come into play. It can depend on the type of business, what you sell and if you are violating any marketing practices. Saying that you didn’t know or that you will remedy the problem immediately, won’t save you from these legal mistakes. What business mistake do you wish that you hadn’t made? Yikes, this is a goldmine here! It’s so easy to get carried with the excitement of a new idea that it’s tempting to dismiss those nagging thoughts before forging ahead. Planning, due diligence, etc. are huge in moving an idea from thought to action. And if it’s MY idea, it must be great, right?!?! Great list for me as I transition my business. Sorry, I missed commenting on your comment from last week Deb. New ideas always seem to light a fire under us, but sometimes it’s not enough for the long haul of all the details and challenges. Glad you found the list helpful as you transition your business. This is a great group and everyone is so supportive, so give a shout-out if you have any questions. These tips are right on! As a freelance writer for over 20 years, I had to learn some of these the hard way. Thanks for sharing your wisdom. Thanks for commenting Julie. The idea is to learn from those who have already made them. But, then again some want to learn it for themselves. OMG… yes… we can NOT do it all, we can possibly do it better, but take note of how others have tried and failed. Getting a legal plan, like Legal Shield (which I have) is a great for piece of mind and contract review…have vision and while I am a perfectionist… everything isn’t perfect! I’ve heard good things about Legal Shield Kristen. The harder we try to control things, it seems the more complicated it gets. Sometimes, we just have to move on from our mistakes. Geez…what a great article. All excellent points. Your first comment, “It’s a great idea and will make a fortune” reminds me of my days as the CEO of the local chamber of commerce. A woman came in with this great business idea — which she’d already set up and spent money creating — and thought it would be perfect for our area. Why? Because no one else was offering this product/service! She didn’t do her market research, because if she had, she would have understood that was she was offering was several generations old in terms of product development. P.S. Her business didn’t last long. Thanks for sharing this woman’s experience. I think we’ve all been there when the creative light bulb goes off for a great idea that we can’t stop thinking of. We want to jump right in and run with our idea. If we just give it some time and check to see if our bright idea is also a viable business, we could save ourselves a lot of heartache. It took me too long to start outsourcing tasks that someone else could do. There’s no point in doing those jobs when we can accomplish more by devoting our time to the things that we need to do personally. Great point about outsourcing Beth. It allows you to focus on what’s really important. Being distracted by so many things opens the door for mistakes. Probably at some time in my own many iterations in the business sphere, I have made all of the above. I am very persistent though and do trust my intuition when something is a very strong “yes” for me. I will take something as far as I can and I trust that I am being supported when I see things flowing with seeming ease. I’ve had to put several of my passions on the back burner during times when I was ill, so this year I am resurrecting a few of those and seeing where they lead me or who is coming towards me. Knowing your strengths is also so important I have learned. I am not the business plan type of person, so I see how collaborating with others who have a different skill set than I do, can be very beneficial. Although, as I’ve also learned, partnerships bring their own challenges. This was a very good read Joyce, as I really relate to all of these points, especially “I can handle everything”. Been there too often and prefer not to do that again. Beverly, as you know everything is a learning process. Believing that we can handle everything is a hard lesson. Yes, there are times things have to go to the back burner, but if the idea is a good one, there will be a time and place to resurrect it. Also, intuition is hard for a lot of people. If you’ve been able to successfully move forward in your business because of it, then go for it. Having an inner guidance you can trust is invaluable when it comes to making decisions. I wish I thought of And bought a more generic organizing name and URL way back when I started my business. I think flexibility is so important. The goal may stay the same but the process to get there may change. Thanks for sharing! I can identify with that. Not knowing what we are getting into or what we actually need is nerve racking. Many times, I just wanted to stop because the whole process was driving me crazy. Absolutely right the key is flexibility. And, I’ll add taking deep breaths as needed. Great reminders! I recently worked with someone who was constantly doing things last minute, and I cannot tell you the stress that put on me. Everything was about “getting it out there” and getting it done. Although i know I can tend to lean towards the person who wants it to be perfect, the other end of the spectrum is just as if not more, dangerous. Yes failure, mistakes are opportunities to learn but take the time to do your homework first, study and be prepared. then when the mistake happens (if it happens) you’ll have a much better idea of how to turn it around. The stress of working with someone, whose working style is different, is one of ultimate aggravation. It also leads to wanting to do everything yourself, which is a blessing and relief for peace of mind. But, also has its own stress and aggravation. Somewhere, it has to come down to compromise. Being able to compromise on perfection is a good place to start. The entrepreneurial journey is quite an interesting, fascinating, challenging and full of possibility. You don’t know what you don’t know when you start out. The practical learning steps are so important as you point out – and also feel the passion and belief in yourself is right up there too. It’s an inner and outer discovery of what works and doesn’t – and tweaking along the way. The journey can be quite growth inducing in many ways. Thanks for the article to shed some light. Excellent description Teresa. We start out with a business idea and then find ourselves on an entrepreneurial journey. We get more than we bargained for, but reap so much more than we anticipated. My biggest business mistake was buying courses that I wasn’t ready to implement. I spent countless hours watching webinars as a way to learn something but did not have the technical understanding to implement & many bought courses did not really teach. I waited too long to find MY teacher who I now have going on 3 years. I feel blessed & I could have started working with this coach years ago but tried others instead. Don’t be too hard on yourself Roslyn. We’ve all bought courses and materials we’ve yet to use. And, you may have taken a circuitous route to get to where you are today, but the path you’re on shines through in the quality of what you create and beauty of your website. Keep up the good fight Susan. I try not to think of how many times I’ve switched course from where I thought I was starting from. Surprisingly, things are far better than if I had insisted on staying with my original ideas. So, there’re lots of possibilities out there to be explored. Good luck.